DO-90205-20 was succesfully added to your cart. Thermometer features a 3-ft flexible cord and °F/°C switchable ranges. Magnetic back allows for placement on metal surfaces such as freezers, incubators, or water baths. Includes a flip-open stand for use on bench or desktop, and a spring fastener for clipping onto any edge.Digital thermometers are inexpensive, easy-to-use instruments that display temperature in a fast-responding digital format. Digital thermometers come in pocket-sized, remote, wall, panel-mount and even tabletop versions. They typically have a stainless steel probe sheath with thermistor or diode sensor. Probes can have varying lengths and are even equipped with extension cables for difficult to access temperature measurement. 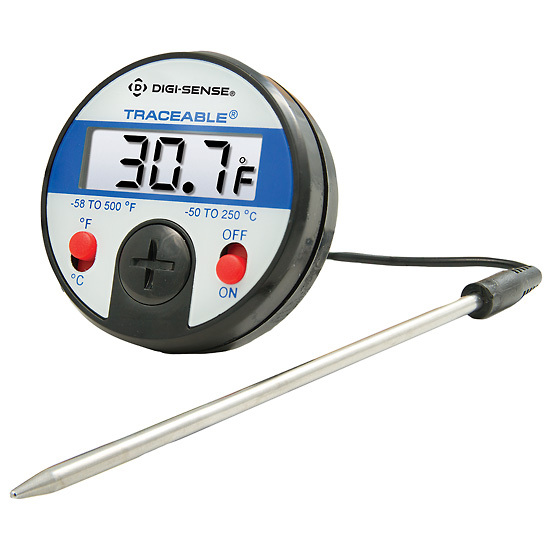 Wireless thermometers are also available for remote digital temperature monitoring. NSF-approved thermometers are waterproof to allow complete sanitization and some even add antimicrobial protection. Pocket thermometers usually require a battery but are available solar-powered for temperature monitoring over an extended period of time. Dual-channel indicators can provide indoor/outdoor comparisons while min/max thermometers give a digital readout of highest and lowest temperatures read. Davis Instruments features general purpose digital thermometers from trusted brands including Extech, Taylor, Cole-Parmer, Oakton, Testo, and Comark. For more information about digital thermometers contact a Davis Application Specialist today. Standard Remote Probe Thermometer features a 3-ft flexible cord for measuring temperatures from a distance. Magnetic back allows for placement on metal surfaces such as freezers, incubators or water baths. Includes a flip-open stand for use on bench or desk and spring fastener for clipping on to any edge. RE: Item# DO-90205-20 - How does this product come packaged? Can I get the packaging weight and dimensions? at what test point this thermometer can be tested? When calibrated, it can be tested at 5 points either across the range or requested points by the customer. Does "remote" in this instance mean that it will still read temperatures when unplugged and taken further than 3 ft away? If not, do you offer any products that would be capable of measuring/displaying temperature of a liquid without being connected via cable/cord? "Remote" in this instance means that the temperature sensing element can be positioned up to 3-ft from the display. For wireless temperature measurement inside a liquid, I suggest the 37486-15 meter. The 3786-02 wireless upgrade kit, the 37486-03 adapter head, and the 37486-08 standard penetration probe would be necessary to take advantage of the wireless ability. Can these be ordered as certified? These come with a NIST certificate, if you need it recertified or recalibrated please contact us by phone to return the item.